Upon settling into our new condo, my partner and I had a great time decorating with the curated collection of items that remained after our major purge upon selling our previous home. After a few weeks of shuffling things around, we found the results quite pleasing, with the exception of our dining room table centerpiece. 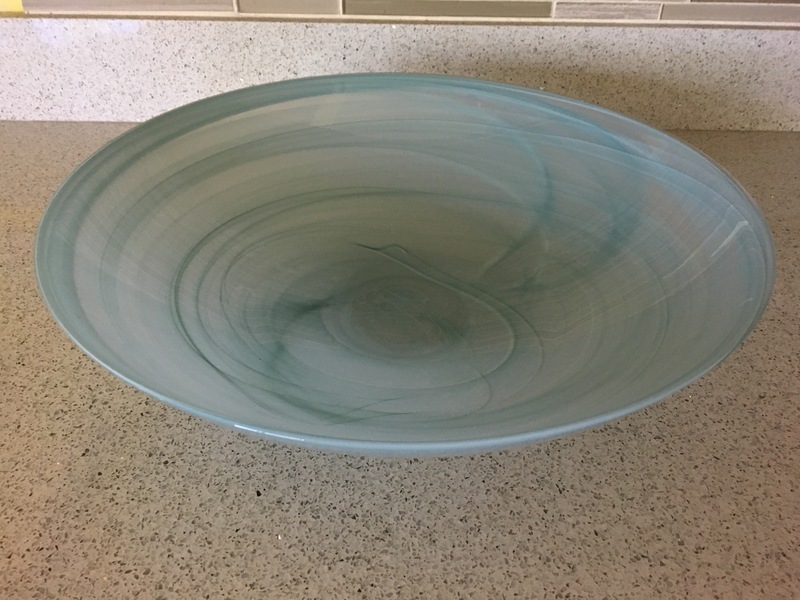 Given the size of the table, which we purchased from the condo’s previous owner, we chose a large (18 inch diameter) glass bowl as its center piece. At our previous home, we had a perfect spot for this bowl, which functioned beautifully as our fruit bowl. However, I never really cared for how the bowl looked on our new dining room table; I felt its soft blue color was not strong enough against the black table and it appeared a bit large or awkward. Additionally, we had relocated our fruit bowl to our smaller kitchen table, so the glass bowl sat sadly empty in the dining room. My mind started cycling between thoughts of keeping the bowl, donating it, or perhaps even selling it. At one point I contemplated storing it in an overhead cabinet (avoidance syndrome! ), but quickly found it too large to fit! Wow, it really was one big bowl! As days passed and I continued to ponder my next steps for this beloved but no longer relevant possession, I found myself referring to the bowl as the “grand piano” — recalling the experience of a coworker who downsized after a divorce, was thrilled to have kept her grand piano as part of the settlement, but spent several stressful months searching for an apartment to accommodate it! After two weeks of allowing the bowl to rest upon our kitchen counter, I decided it was best to give her a new home. I wrapped her carefully in tissue paper and bubble wrap, and dropped her off at our local charity donation center. As I drove home, I smiled as I thought of the beautiful music that will soon emanate from her new home! Previous I Spend $27 on My Hair Every Week!